This is not the bottle for the true sulphur-sensitive or the sulphurphobe. I’ve had it open now for a few years and the notes of sulphur, which were muted at first, have expanded a fair bit. The sulphur here is of the savoury gunpowder/struck matches variety; and I am in the seeming tiny minority in the whisky geek world that does not find this to be objectionable per se, and indeed sometimes quite enjoys these notes when in balance with others. All this to say that while I am not overly bothered by the notes of gunpowder here, I can see how others might dismiss this as a flawed whisky. I myself might not be very pleased if I’d paid an exorbitant price for it, but I found it a few years ago sitting in plain sight on the shelves of a local liquor store with the original price from the time of release still below the bottle. Or rather, the price tag was below an OMC Glenlivet bottle but the manager found the right bottle in the back (he was insistent that if they’d actually sold out of it they would have removed the tag from the shelf). This was distilled in June 1981 and 360 bottles were bottled in October 2002. I note these details as there’s no further cask information on the box or bottle. Nose: A lot of gunpowder and struck matches at first sniff, and also at second and third. Below it there’s orange peel and some toffee and increasing salt and some smoke as well. Let’s wait a while and see if the gunpowder dissipates a little. Well, a few minutes later it’s still there but the oranges are speaking more loudly too now and there’s just the slightest bit of maple syrup too. With a lot more time it may be that my nose has adjusted to the gunpowder but it is far less dominant. Now I get lime and ham and brine with mustard seed and other sharp spices in it. More toffee now too and a bit of rubber; something creamy too. With even more time (sulphured) raisins and dried apricot. Water (added more than 30 minutes after this was poured) pushes the gunpowder back a little and brings out more of the sweet/savoury ham notes. Finish: Medium. The gunpowder lingers as does the smoke. With time the finish lengthens and becomes quite a bit sweeter. With even more time the citrus and salt linger into the finish. Well after the last sip there’s a distinct peaty aftertaste. Comments: Again, I can see how someone who has a low sulphur tolerance might hate this (see, for example, the notes at the bottom of this post at Diving for Pearls). But as someone who, as I think I’ve mentioned before, ate a lot of rock salt/kala namak based sweet and savoury treats as a kid, I have a very high tolerance, nay fondness for this particular flavour of sulphur. Still, this is a whisky that needs a lot of time, air and patience and a large enough pour to allow for proper development. The whisky I’ve had recently that most puts me in mind of this one is the Highland Park Loki, which has a similar, though more muted, gunpowdery, leathery, briny quality. Rating: 88 points (starting out in the low-80s and climbing slowly). Go ahead, call me crazy. 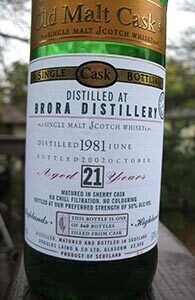 This entry was posted in -Whisky by Rating, 85-89 points, Brora, Douglas Laing, Whisky by Bottler. Bookmark the permalink. Ah ha, I knew this one sounded familiar! I’m glad you reviewed it. While I didn’t give it the Full Murray, it certainly was a lot of sulphur in my face. I do like a little sulphur in a whisky, like pepper in an entree. But this one seemed like sulphur was the dish, and everything else was seasoning. When I was a kid, snow trucks used to spray rock salt on the roads to melt the ice. And I used to pick it up and eat it. Clearly that did nothing for my palate. Question for you. Have you found the sulphur note receding as you’ve made your way down the bottle? With this Brora, my sample came right from the top of the bottle at an event. I have a bottle of something else that was all gunpowder at the start of the bottle, but by the time I got to mid-bottle the sulphur receded far into the background. Hi Michael, I’d actually say the reverse was true for me. I didn’t remark any off-notes when I first opened the bottle. In fact, I rated it even higher then. However, this is not necessarily to say that there was less of a sulphur note then; it may only be the case that at the time I was not particularly alive to issues of sulphur in whisky. It’s only relatively late in my whisky drinking “career” that I began to engage with other whisky geeks online and when I bought this whisky I had never worried about E-150, chill-filtration, sulphur or any of the other smaller whisky geek complaints/memes. It is entirely possible that these notes were present then too but didn’t present themselves as different facets of the same flaw because I didn’t have a name for that flaw. Sorry if this all seems too abstract. I will say that even now when I know to give the name “Sulphur” to these notes as a group they don’t bother me very much. I do think the whisky is less balanced now than it was 3-4 years ago but the sulphurous qualities are savoury/briny/gunpowdery/leathery ones I find and enjoy in contemporary Longrows and Springbanks and, to a lesser degree, in some Highland Parks as well . And I think with enough time, air and water they recede enough to let all the other qualities of this whisky emerge. Sku actually has a sample of this from me, as does my friend Rich–I’ll be interested to see what they make of it. It wouldn’t surprise me if I’m alone in rating it as highly as I do–there don’t seem to be very many notes on it around. Yeah, there really aren’t many reviews of this whisky. It’s great you’re spreading the Brora OMC experience because I’m curious as to how folks with different palates perceive it. I won’t call you crazy on this one, especially since I geek out for Longrows and indie Ardmores, I think I sort of know where you’re coming from. I also appreciate your observation about having “never worried about E-150, chill-filtration, sulphur or any of the other smaller whisky geek complaints/memes” before engaging deeper into all the whisky talk. It’s become more difficult for me to enjoy some of my old favorites because I’ve become hyper-aware of much information and geekery. That’s the darker side of knowledge influencing perception. So ends this confessional. Actually, a couple of other people who comment occasionally here also have samples from me: bryan f and bpbleus. Perhaps we could have a whole chorus of people telling me I’m crazy. Its hard to get past the sulphur on this MAO. Ill try again and leave it in the glass for 30 minutes next time. Im glad i had an opportunity to try this, as it’s only the second (and probably last) brora i’ve been able to taste, but i like the signatory one much better. The flavors are much cleaner and i can get a better sense of it all together. I cant get that with the OMC. Its what i would call a scope restriction in accounting terms; when there’s some kind of limiting of information that prevents me from giving an opinion. Im surprised the signatory was under a 90, but im a total noob at this. Hey i even liked the brimstone! MAO, you might be interested to know that there’s a new (and lengthy! in a good way) review of this bottle on Connosr. The reviewer, Nock, references your review here quiet a bit. Thanks for pointing me to that. I don’t have a Connosr account but Nock, if you read this, you should know that while I found much more sulphur at the time of this review (near the end of the bottle’s life) I didn’t find it offensive at all. But when I first opened the bottle I liked it even more—I had it at 91 points in my spreadsheet.